In his new series, Greek Street, writer Peter Milligan sets his sights on modernizing and, perhaps, romanticizing a vaguely familiar set of myths and parables. In this instance, those influences are noticeably (and, given the title, predictably) Greek. Although the timeframe is decidedly modern and the location undeniably British, (The real life Greek Street is situated in London) there's no mistaking the origin of many of the stories within this issue. Eddie, the first chapter's fleeting focal point, wastes no time in revealing himself as a modern-day Oedipus. The mafiosos that control much of the city call themselves the Fureys. It's not exactly rocket science if you're aware of the subject material, but Milligan does a decent enough job of casting these ancient myths in a modern light and freshening things up. Which isn't to say this is a particularly easy read… actually, quite to the contrary. We're introduced to so many new faces, expected to remember so much, that many of the finer points of each personality undoubtedly slip by the wayside. Some characters speak in riddles, others try to make sense of it, and in the end the readers are left feeling like they've just tangled up a big mess of cords behind the entertainment center. The more we try to settle down and understand where these people are coming from, the more tightly that little ball of confusion squeezes together. 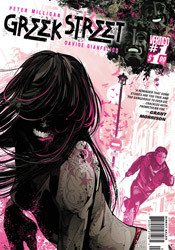 David Gianfelice brings a visual sense to the title that's right at home in a Vertigo series. His stylized, restrained efforts show the influences of a broad variety of artists, Chris Bachalo and Mike Mignola in particular, while adding a graceful, European sensibility to the mix. Although his methods are minimalist at heart, Gianfelice doesn't shy away from details, neither in the foreground nor the scenery that fills his backdrops. In fact, the world represented within the pages of Greek Street is surprisingly vibrant and lush, detailed with the utmost care but also not obsessed over. This issue moves along fairly quickly, but Gianfelice maintains a firm hold on the reigns and never lets the pace get out of control. His storytelling abilities are admirable, able to do their job and step out of the way without drawing too much attention. And although his illustrations are generally very simple, the grace and elegance of his linework is unusual in a good way. At a glance, his work doesn't seem particularly involved or even all that special, but upon closer inspection it really begins to shine. Keep an eye on him. It's tough to climb in on the ground floor of a series like this one and offer a definite verdict, because there's still so much that's yet to be revealed. Certainly, all the pieces seem to be in place for Greek Street to deliver something significant, but that's neither here nor now. As regular-sized debuts go, this piqued my curiosity, if nothing else. Like many of his Vertigo predecessors (and contemporaries) Milligan's writing leaves a lot up in the air, with even more open to interpretation. His teammate, artist David Gianfelice, is more immediately appreciable. If you're a fan of the imprint, first issues like this one should come as no surprise – you'll know that the eventual payoff is usually worth the initial tease. It's worth a longer look than usual, but isn't something that's going to grab your imagination with both hands and start twisting. Not right away, at least. Borrow it.